this is not a paid ad, although the way i've composed this entry in my head, it just might read like one. there's a new player in the already crowded public utility bus arena, but this company's new franchise is richly deserved. its presence on the streets of makati may not yet be as strongly felt as it should be because as i learned the other day, there are only two units plying opposite routes along kalayaan avenue and gil puyat avenue. commuters are also ultimately unaware that a new entrant in the public transport industry seeks to change the game by introducing a new breed of buses: the kind that don't contribute to the poor air quality we all are victims to. i'm talking about the green frog zero emissions transport company and their well-equipped, china-made (you can draw whatever conclusions you like) hybrid buses. it was pure happenstance that i stumbled upon the facebook page of green frog, and it got me excited. 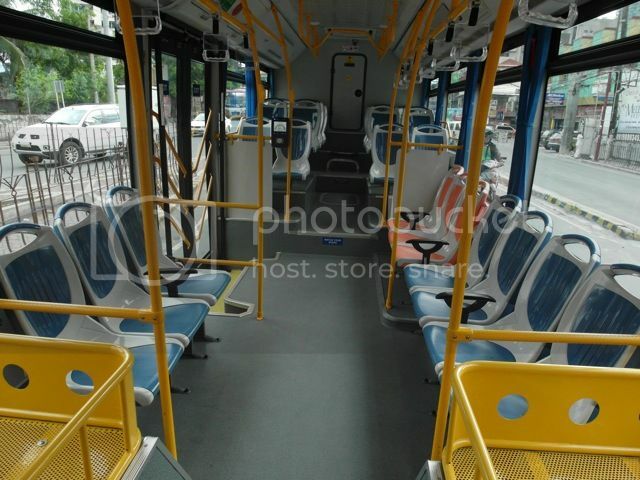 i've always wondered why the buses in metro manila are the way they are: resembling buses with provincial routes in many ways, but with a hollow and unutilized bottom compartment. 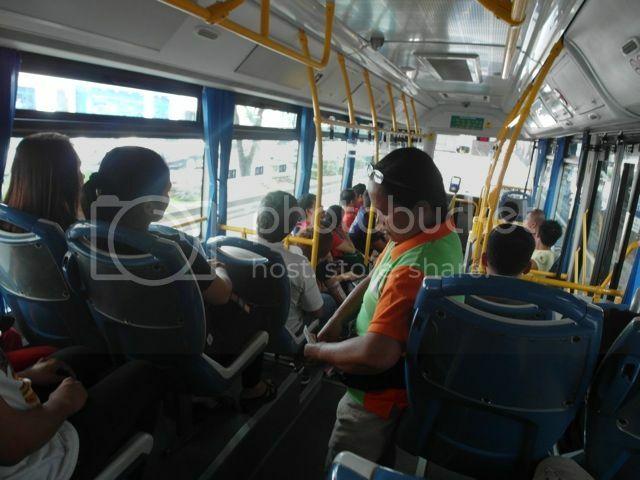 of course one might say (and this is how i answered my own query) that the reason our inter-city buses are outfitted with cushioned seats is that people who go home to the suburbs of quezon city or caloocan from their workplaces in makati or ortigas have to spend many hours trapped in slow-moving traffic. but apart from providing comfortable seating, the usual buses have narrow aisles and only have a single door, which makes both boarding and alighting tiresome chores. i can list many other complaints about most buses (their cutthroat competition for passengers, their daredevil drivers who have no regard for the safety neither of their passengers or other vehicles on the road, their penchant for violating traffic regulations), but the entry of green frog gave me so much hope that we are about to enter an era of civilized public transport. based on information i gathered from their website, i found out about specified bus stops along its route. green frog is obviously meddling into jeepney territory, since kalayaan and gil puyat avenues are served by relics of american colonization and filipino "ingenuity". so i walked towards the corner of reposo and buendia to wait for my bus. it took a while, but i was happy to spot it a few meters away as it approached. 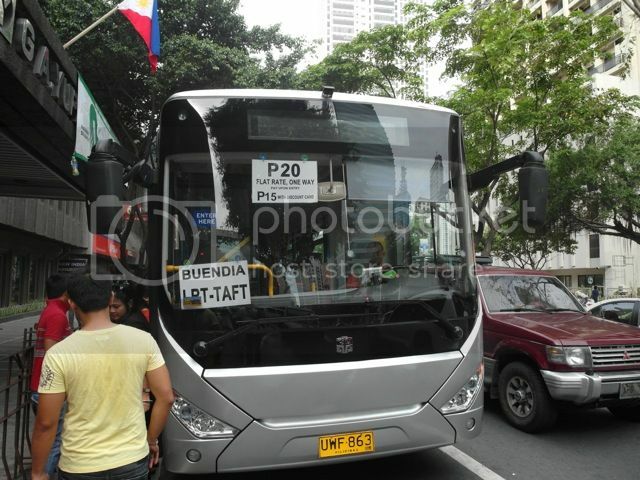 it had a public address system where the driver announced the stop as well as his route: buendia, buendia, he barked. i prepared my 20 peso bill since there is a sign outside that says: please pay UPON boarding. for people who've traveled to other parts of southeast asia, this isn't strange: you really have to pay your fare when you ride. so i suppose i was the most well-traveled passenger on that specific ride since everyone basically scrambled for a seat, while i dropped my orange bill into a slot beside the driver. a conductor was around to collect payments, but she issued no tickets so she frequently asked passengers if they've paid. i immediately asked the conductor about the prepaid card -- although i doubt i will be riding the bus very often, i thought it was a smart thing to do. 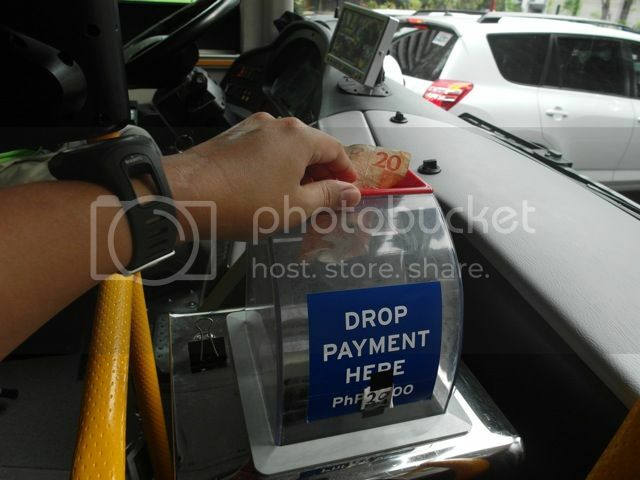 besides, the card gives you a 5 peso discount for each ride. 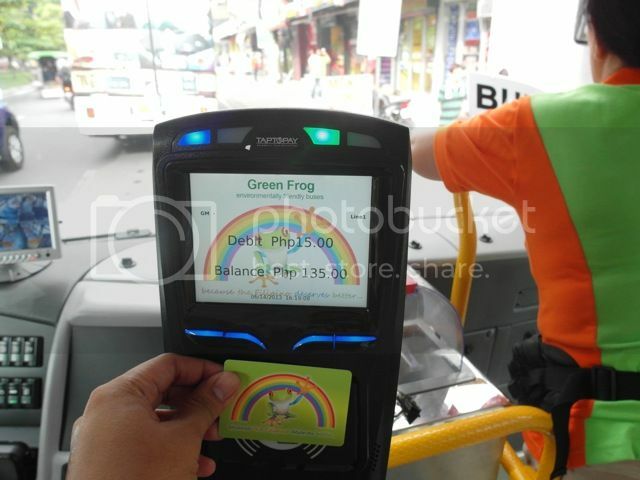 regardless where you're getting off, green frog charges a flat rate of 20 or 15 pesos. the interior of the bus is almost alien, unless of course you've been (a) abroad, as i mentioned, or (b) work in the BGC area. the bus has a low profile, with a lighted sign in front that states its destination or route. there are baskets behind the driver for luggage. there are a few hard plastic seats (the bus seats 27 by my count), with a large area in its bosom for standing passengers. there are two doors: one in front for boarding, and another one at the back for alighting passengers. it's also equipped with CCTVs, and the driver has a small screen which allows him to see what's going on inside his bus, and even outside, in case he needs to back up. the airconditioning is fine -- there is no steady stream blowing freezing air onto your head. i also noticed a fire hydrant beside the exit door. some observations though: the driver of the green frog bus that i boarded behaves and acts like any other bus or jeepney driver. despite its designated bus stops, he picked up passengers and unloaded them at regular stops that often contribute to gridlocks. the conductor explained that people aren't aware yet, although the route is also displayed inside the bus itself. people are also unaware of the difference between the front entry door and the rear exit doors. they get on where they wish, and the driver obliges them by opening both doors at the same time. there is no button for passengers who wish to alight, and peculiarly, no television to entertain passengers caught in traffic. which is not such a bad thing. like i mentioned there is so far only 2 buses alternating on the LRT-bound and C-5-bound routes along kalayaan and gil puyat avenues. more are on their way, so explains the conductor, and they should be rolling on the streets of makati before the end of july, but in the meantime, if you want to catch a ride onboard these zero emission buses, you may want to wait at any of the bus stops along their routes. i'd list the stops here, but it's useless since, like i said, you can flag the buses anywhere -- at least until commuters learn. you'll know because there are signs on the street. if you don't like waiting, you could actually text the bus to ask where they are. the numbers are +63 917 640 3143 and +63 917 640 3148 (don't worry because it's the conductor who replies). i like the slogan of green frog. they say that the filipino deserves better. i like it because it's true, but lament that it's a little late. the filipino deserved better a decade ago. so all the more reason we should support private endeavors to improve the lives of filipinos. and i hope the success of green frog will encourage a shift in the attitude of common carriers, not just in makati city, but in all cities all over the country.